Combined Category D, C, B tested protector (to BS EN 61643-21) suitable for twisted pair signalling applications which require either a lower in-line resistance, an increased current or a higher bandwidth than the D Series. Also suitable for DC power applications less than 1.25 amps. Available for working voltages of up to 6, 15, 30, 50 and 110 volts. For use at boundaries up to LPZ 0A to protect against flashover (typically the service entrance location) through to LPZ 3 to protect sensitive electronic equipment. 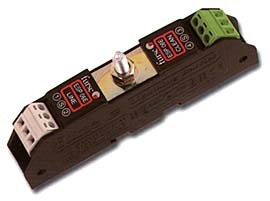 Use these units to protect resistance sensitive, higher frequency or running current systems, e.g. high speed digital communications equipment or systems with long signal lines. Connect in series with the data communication or signal line either near where it enters or leaves the building or close to the equipment being protected (e.g. within its control panel). Either way, it must be very close to the systems earth star point. Install protectors either within an existing cabinet/cubicle or in a separate enclosure.